Description: Huntsman has searched its archive to come up with this contemporary take on a heritage design, and brought the cartridge bag to another level of elegance and functionality. Featuring Huntsman house tweed, Havana bridle leather trim, a fast-access outer front cartridge holder and a magnetic closure, those seasoned guns will understand the importance of this fusion of bag and belt, essentially ending the debate on which is best. In the creation of this lot, Huntsman worked with luxury leather goods manufacturer Simpson in London, a brand dedicated to creating exquisite, enduring and functional leather goods, hand crafted in East London. 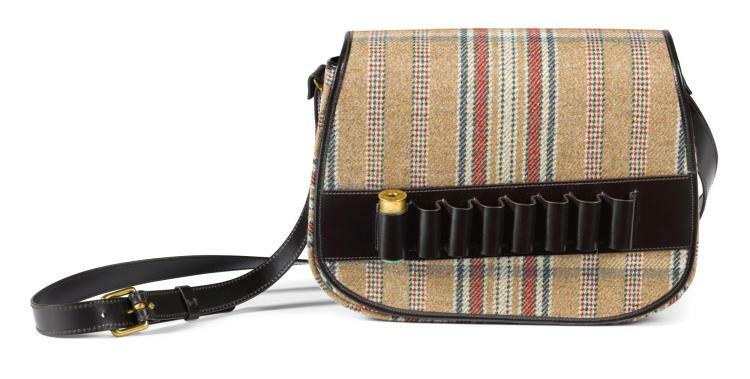 The bag offered here features a belt made for 12 gauge cartridges, however can be made for 20 gauge cartridges for the buyer upon request (with a lead time of 6 weeks).